Maple & Co is the data controller of the personal information we hold about you. Whilst Maple & Co will not pass on any information to other parties or bodies, with the exception of government bodies if requested, your details will be kept on record and added to our mailing list. You can stop this at any point by informing us via e-mail that you no longer wish to be contacted with Maple & Co newsletter. Third Party websites, although Maple & Co will not pass on any information to third parties, the website may have links to other websites – Maple & Co cannot be held responsible for other websites data protection policies. 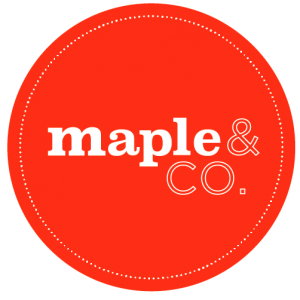 Maple & Co may also collect information regarding your visit to mymapleandco.com. This may include where you are geographically, how you were referred to us (e.g. search engines or email marketing), your browser and device type, the pages you viewed, the duration of your visit and any search terms used. This information may be collected even if you do not register an account with us. At present there is not an industry-wide uniform standard that has been agreed and adopted to determine how DNT requests should be managed. As a result, mymapleandco.com does not currently respond to DNT requests. We will continue to review our DNT process and other new technologies.